Can they get any cuter?! To say 2017 has been a big year for Chance the Rapper would be an understatement and it's not even over yet. One of his biggest accomplishments included winning big at the 59th Annual Grammy Awards for his highly acclaimed mixtape, Coloring Book. Throw in some more music-making, philanthropy, and activism, and you've basically summed up his year. The Chicago native walked away with THREE big awards including Best Rap Album for Coloring Book (yes, it is a mixtape but w.e. ), Best New Artist, and Best Rap Performance. Well, those Grammys finally arrived in the mail and Chance couldn't wait to open them up with his biggest fan, his daughter Kensli. 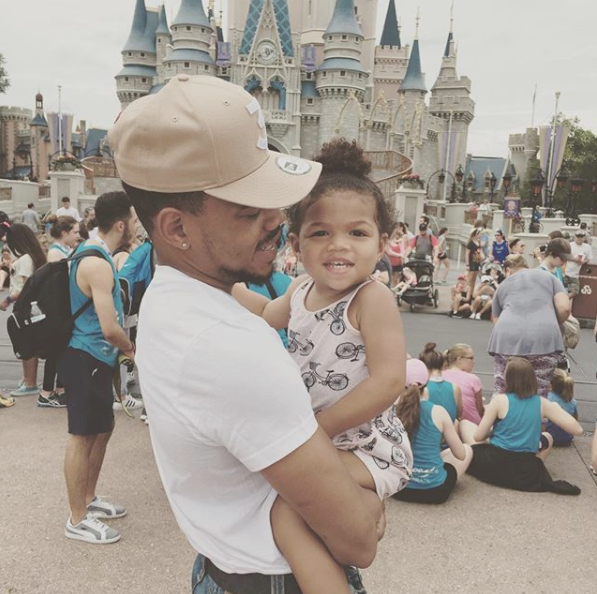 In a two-part video he uploaded to Twitter, fans get to witness just how special the moment was for Chance and his mini-me. As soon as the first box is open, Kensli gives daddy a BIG hug. And because he's an awesome celebrity parent, he used his accolades to help Kensli with some fundamental early math skills. Learning your numbers by counting Grammys, can you imagine, LOL! As soon as box number two is opened, what does Chance's adorable toddler do? Give her daddy an even BIGGER hug! But when it came down to box number three, Kensli was already a Grammy Award pro. So much so, Kensli even helped Chance put the award away, despite him thinking it might be a little too heavy for her. And Chance became so overwhelmed by the love from his family, the Academy, and his fans, that he broke down and cried.